U.S. Transportation Secretary Ray LaHood announced May 4, 2012 that Illinois, Indiana and Michigan have agreed to move forward with a comprehensive study that will help determine ways to reduce rail congestion and let trains achieve higher speeds along the Chicago-to-Detroit high-speed rail corridor. The goal of the study, which will be funded through a $3.2 million grant from the Federal Railroad Administration and $200,000 each from Illinois, Indiana, Michigan and Norfolk Southern, is to reduce passenger travel times between Chicago and Detroit and efficiently move freight through one of the nation’s busiest freight rail networks, the congested Chicago to Porter, Ind., segment. An important focus of the study will be reducing congestion by linking a double track passenger main to the 110 mph service at Porter. The study will build on progress Michigan has already made by achieving 110 mph service from Porter to Kalamazoo. The Chicago to Detroit line is part of the Midwest Regional Rail Network, which is located in one of five densely populated mega-regions, areas already overwhelmed by congestion and in need of better transportation options. Bringing safe, fast, convenient, affordable high-speed rail to these areas will create jobs, increase economic opportunities and relieve congestion. More than 100 million people call the Midwest region home, with the vast majority of residents living within 500 miles of the Chicago rail hub. Using the Gross Domestic Product as a measure, the Great Lakes-Midwest economic region would be the fifth largest economy if it were its own country. The Federal Railroad Administration and its 32 state partners are making great progress on High-Speed and Intercity Passenger Rail projects across the country. With $10.1 billion in federal funding, they’re moving forward with 153 projects, laying the foundation for a 21st century passenger rail network. 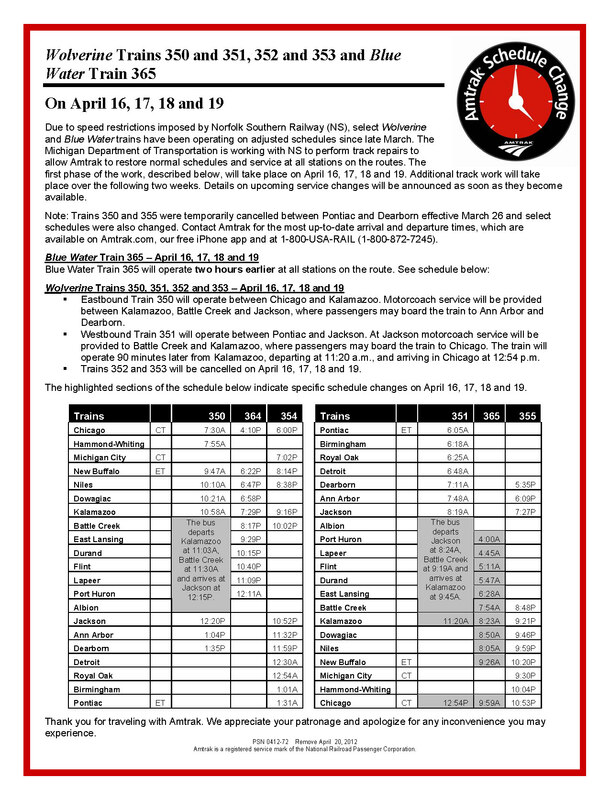 Following work set to begin April 16, Amtrak services for Wolverine and Blue Water passengers can expect normal travel times on Norfolk Southern Railway (NS) track in Michigan by early May. While NS crews work to eliminate the temporary “slow orders” the railroad imposed on March 15, certain trains will be cancelled, have different schedules, or have segments covered by dedicated motor coaches, to allow completion of track work on April 16, 17, 18 and 19 (see attached.) Amtrak service in mid-Michigan will continue to be delayed from 45 to 90 minutes on Pontiac-Detroit-Chicago Wolverine trains, with lesser delays to the Blue Water trains to and from Chicago and Port Huron. Train 350, the morning eastbound Wolverine from Chicago to Pontiac, will terminate at Kalamazoo. Passengers continuing east of Kalamazoo will be accommodated on a dedicated bus serving Battle Creek and Jackson, where passengers will reboard a train for the remainder of the trip to Dearborn and intermediate stations. Train 351, the morning westbound Wolverine from Pontiac, will terminate at Jackson. Passengers continuing west of Jackson will be provided with dedicated bus service to Battle Creek and Kalamazoo, where they will reboard a train for service to Chicago and intermediate stations. The Kalamazoo departure of the continuation of train 351 will be 90 minutes later, at 11:20 a.m., arriving in Chicago at 12:54 p.m. CT. The late morning Wolverine 353 from Pontiac to Chicago is cancelled. The early afternoon Wolverine 352 from Chicago to Pontiac is also cancelled. Wolverine trains 354 (Pontiac to Chicago) and Train 355 (Dearborn to Chicago) will continue to operate with delays until the track repairs are completed. Blue Water (Train 365) operating eastbound between Port Huron and Chicago, will depart Port Huron two hours earlier at 4 a.m.
All intermediate stations between Port Huron and Chicago also will be served two hours earlier than the published schedule. Amtrak has posted temporary schedules for service on the Wolverine and the Blue Water (364 and 365.) The Blue Water uses NS-owned track between Battle Creek and Kalamazoo. Further significant temporary changes to accommodate track work after April 19 will be announced as details become available in Passenger Service Notices at stations, shown as part of the booking process on Amtrak.com, and posted at Amtrak.com/Alerts. Amtrak is operating all available railcars and locomotives on trains to and from the Chicago area in advance of the Thanksgiving holiday travel season. Fresh from fall colors trips to and from the East Coast, starting today the historic Amtrak “Great Dome” rail car will provide a unique opportunity to experience city and prairie views to and from Chicago as it adds extra seating capacity to super-size the busy trains. The dome car features an upper level with windows on all sides – as well as overhead – to provide passengers with panoramic views. The dome section runs the full length of the car, a rare feature even when dome cars were more numerous on the nation’s railroads. The dome car is scheduled to operate on the following Lincoln Service, Saluki/Illini and Wolverine Service trains to and from St. Louis, Carbondale and Detroit/Pontiac on the following dates: Trains 301 & 304 on Nov. 17, Nov. 19 and Nov. 25, Trains 303 & 306 on Nov. 18 and Nov. 26, Trains 391 & 392 on Nov. 21, Train 305 on Nov. 22, Trains 300 & 352 on Nov. 23, Train 351 on Nov. 24, Train 393 on Nov. 27 and Train 390 on Nov. 28. Seats in the dome car are not reserved and are available on a first-come, first-served basis. The heaviest single travel day of the year for Amtrak is the Wednesday before Thanksgiving which set a record last year of 134,230 passengers for the day. Amtrak also set a record last year by transporting 704,446 passengers for the holiday week. Amtrak anticipates similarly strong ridership for this year’s Thanksgiving travel. From Nov. 23 to 25, passengers traveling on Amtrak long-distance trains will be offered a menu item of a traditional Thanksgiving meal featuring a fully-cooked turkey breast with gravy, stuffing, cranberry sauce and side accompaniments. Pumpkin pie with whipped cream and maple walnuts will be offered as a dessert option. Amtrak is working to make the holiday travel experience as pleasant as possible and encourages passengers to consider the attached holiday travel tips to help ensure a smooth trip. The only remaining dome car in Amtrak service, car number 10031, is a Great Dome car previously used on the Chicago-Seattle Empire Builder when the train was operated by the Great Northern Railway and the Chicago Burlington & Quincy Railroad (later the Burlington Northern Railroad). It was built in 1955 by the Budd Company for the Great Northern and carried the name “Ocean View,” car number 1391. It was conveyed to Amtrak in 1971, with this car first being given the number 9361. It was renovated in 1985, renumbered 9300, and used in daily service on the Amtrak Auto Train to and from the Washington, D.C., and Orlando, Fla., areas through 1994. It was further refurbished in 1999, renumbered to 10031. This year, the “Ocean View” has been freshly re-painted in honor of Amtrak’s 40th Anniversary in the Amtrak Phase III paint scheme and wears stripes comprised of equal red, white and blue stripes, symbolic of Amtrak being America’s Railroad®. DALLAS, Nov. 1, 2011 /PRNewswire/ — Greyhound, the largest North American provider of intercity bus transportation, and 7-Eleven, Inc., the world’s largest convenience retailer, today announced that customers nationwide can purchase bus tickets online or over the phone with cash, giving them access to special fares and offerings currently available only via the Internet with a credit or debit card. Starting today, consumers interested in purchasing a Greyhound ticket with cash can go to www.greyhound.com to select a schedule and put a ticket on hold for up to 48 hours. Customers then print a payment barcode and take it to 7-Eleven stores operated and franchised by 7-Eleven, Inc., where they can purchase the ticket at the register. To make a reservation by phone, customers first go to any one of the 6,400 participating 7-Eleven stores nationwide to pick up a re-usable Greyhound card. After booking with an agent over the phone and giving the agent the unique card number, the customer’s card is swiped at a 7-Eleven outlet’s cash register, and the transaction is complete. These new ticketing options are particularly significant to the 25 percent of American households that do not have a debit or credit card. For these unbanked and under-banked consumers, purchasing a transportation ticket with cash has traditionally been a time-consuming and difficult process, requiring special trips to a ticket office or the purchase of an expensive pre-paid debit card. In contrast, PayNearMe’s innovative technology allows consumers to use payment barcodes or Greyhound cards to obtain tickets in their own neighborhoods 24-hours a day. Greyhound tested this first-of-its-kind program in the Dallas/Fort Worth Metroplex over a three-month period earlier this year. All 270 7-Eleven stores in the Metroplex completed a Greyhound cash transaction while ticket sales climbed. Based on the success of the pilot program, the companies decided to roll it out nationally. PayNearMe’s Greyhound cards are available today at participating 7-Eleven stores. Greyhound is the largest North American provider of intercity bus transportation, serving more than 3,800 destinations across the continent. The company also provides Greyhound Package Express (GPX) and charter services. For fare and schedule information and to buy tickets call 1-800-231-2222 or visit the website at www.greyhound.com. For the latest news and travel deals, follow GreyhoundBus on Twitter at http://twitter.com/GreyhoundBus and Like us on Facebook at http://www.facebook.com/GreyhoundBus. 7-Eleven, Inc. is the premier name and largest chain in the convenience retailing industry. Based in Dallas, Texas, 7-Eleven operates, franchises or licenses close to 8,900 7-Eleven® stores in North America. Globally, there are approximately 43,500 7-Eleven stores in 16 countries. During 2010, 7-Eleven stores worldwide generated total sales close to $63 billion. 7-Eleven has been honored by a number of companies and organizations recently. Accolades include: #2 on Forbes magazine’s 2011 list of Top Franchises for the Money; #4 spot on Entrepreneur magazine’s Franchise 500 list for 2009, #3 in Forbes magazine’s Top 20 Franchises to Start, and #2 in Franchise Times Top 200 Franchise Companies. Hispanic Magazine named 7-Eleven in its Hispanic Corporate Top 100 Companies that provide the most opportunities to Hispanics. 7-Eleven received the 2010 Retailer of the Year honor from PL Buyer because of the company’s private-label brand initiative. 7-Eleven is franchising its stores in the U.S. and expanding through organic growth, acquisitions and its Business Conversion Program. Find out more online at www.7-Eleven.com.